In politics and public opinion, affordable housing is at a tipping point, capturing attention in the media and securing bipartisan support at all levels of government. 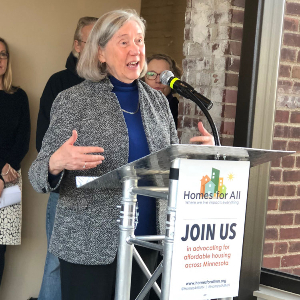 At the Minnesota state legislature, Homes for All has been successful in informing and galvanizing advocates from across the state to encourage their lawmakers to support increased investments and smart policies that support the full housing continuum. Especially during the legislative session, things move fast! Stay up-to-date with the latest news by reading our Homes for All blog, exploring highlighted media articles related to our issues, signing up for our email updates and following us on social media.